This past April 8th federal prosecutors made known former Republican House Speaker, Denis Hastert, sexually molested at least four boys while employed as an Illinois high school wrestling coach beginning in the 1960s. Prosecutors said there was “no ambiguity” about these abuses. They were, they said, “known acts.”1 While the news was disturbing sexual and all other forms of child abuse is commonplace. According to the Centers for Disease Control’s (CDC) Adverse Childhood Experiences (ACE) study, one in four girls and one in six boys are sexually assaulted before they reach the age of eighteen.2 It cannot be a surprise therefore that even a member of Congress molested young boys. Also not surprising is how frequently child abuse, if made known, is not revealed until many years later. Rumors about Hastert’s behavior persisted for years, for example, they were floated during 2006 when Congressman Mark Foley was forced to resign for forwarding soliciting e-mails and sexually suggestive instant messages to teenaged boys. It was not until last year Hastert’s actions nearly fifty years ago became known albeit accidentally. What banking officials and eventually the FBI wanted to learn, pursuant to the PATRIOT Act and other federal laws, was why Hastert made multiple $50,000 bank withdrawals over two years. Hastert initially told officials he was buying vintage cars and stocks. He then explained he did not think banks were safe and then argued he was the victim of extortion. None of these explanations were true. Eventually, the FBI learned Hastert was paying a victim for his silence. Like Hastert, Jerry Sandusky was convicted in 2012 on 45 counts dating back to 1994. It has recently come to light Penn State paid a settlement stemming from Sandusky’s abuse in 1971. Predatory behavior exhibited by thousands of Catholic priests were also not made known for decades. Jerry Savile engaged in wide spread pedophilia undeterred for over six decades including abusing boys under hospice care. The Boy Scouts held “perversion files” for nearly a century. Abuses at New Your City’s Horace Mann School made known a few years ago date back to the 1960s. The Boston Globe has recently reported hundreds of children were molested over many decades at at least 67 elite private schools in New England. USA Swimming’s “Hall of Fame” coach Rick Curl’s 1980s sexual abuse of a female teenage swimmer was, at the time, allegedly made known to his employer, the University of Maryland. The university never reported the abuse to Maryland state officials. Curl was not convicted until 2013. A month later the FBI responded. In three brief paragraphs the FBI stated, “representatives recently met with USA Swimming officials and discussed applicable federal violations associated with child exploitation matters,” and “provided information to assist in USA Swimming’s effort to educate their membership regarding the sexual exploitation of children.”4 It appears the FBI took no further action. In June 2013 Mr. Miller also requested the GAO investigate the abuse of student athletes’ participation in swim clubs. The GAO report was not published until May 2015, or several months after Mr. Miller retired. The GAO admitted it “did not assess the effectiveness of any of the selected athletic programs’ policies.” The report’s conclusion simply stated the “GAO makes no recommendations in this report.”5 It’s worth noting, recently another USA Swimming Hall of Fame Coach, Joe Bernal, was banned for life for sexual misconduct. In efforts to meet with members of Congress over the past decade we have either received no response or were told, for example by Representative Elijah Cummings’ office (Cummings is currently the ranking minority member of the House Oversight and Government Reform Committee), that he only meets with constituents. We did meet with Diane’s representative, Chris Van Hollen, and his staff. After discussing survivors’ issue over several months we failed to interest his office in any number of a wide range of inter-related issues including the need improve child abuse reporting and data collection, the need to improve related clinical research and treatment including diagnosis and treatment of DID, the need for further protections under the Americans with Disabilities Act and other legal protections for survivors. Concerning this last issue, Hastert could not be criminally prosecuted as a child molester because the statute of limitations for this crime had expired. Hastert’s victims could have pursued him in civil court only because Illinois has comparatively liberal “window laws.” In many states a victim’s “window” to pursue their perpetrator in court closes quickly. For example, in New York the window closes five years after the victim turns 18. When the 2013 documentary, “Pursuit of Truth: Adult Survivors of Child Sexual Abuse Seeking Justice,” was released, a film specifically about the inability of survivors to seek and receive justice, we hoped it would serve to stimulate discussion. We were wrong. We tried to present the film to relevant Congressional committees, at White House, to Maryland State legislators and, among others, to the American Bar Association’s Commission on Domestic and Sexual Violence. No one was interested.12 Our only success, or related success, was in attaining pro bono legal counsel from a well-established DC law firm. Years later we learned the firm supported our efforts largely because the attorney we initially solicited was, while serving as an altar boy, molested by his priest. 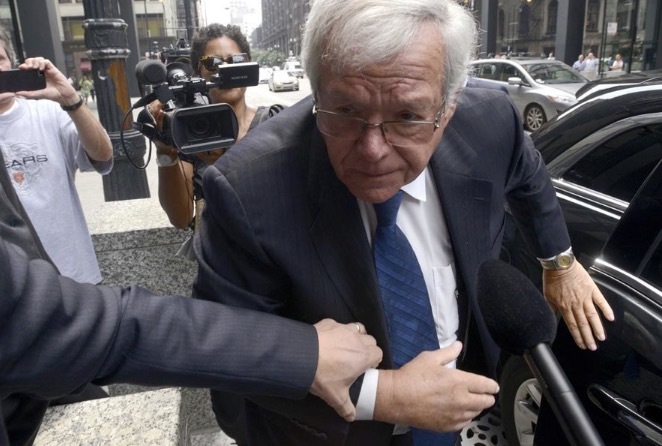 In the federal government’s sentencing recommendation, prosecutors wrote, “He [Hastert] made them feel alone, ashamed, guilty and devoid of dignity.” “All of them carry the scars [the] defendant inflicted upon them.” “It is profoundly sad,” prosecutors wrote, the abuse was inflicted by “a man whom they trusted and whom they revered as a mentor and coach.” In sentencing Hastert to 15 months in prison, Judge Durkin stated, “nothing is more stunning than having the words “serial child molester” and “Speaker in the House” in the same sentence.”13 It is “profoundly sad.” It is not “stunning.” With one exception, the fecklessness of the Congress, the White House, the health care media and leading organizations does not disappoint. The indifference, the ongoing neglect, the failure to even make public comment is exactly what Stanley Tucci’s “Spotlight” character, Mitchell Garabedian, meant when he stated,”if it takes a village to raise a child, it takes a village to abuse one.” As for Diane’s work she is now dedicating all her time to opening a community center in inner-city Baltimore to provide non-clinical, social support services to adult survivors. 1. An overview of the Hastert case is contained in the “Government’s Position Paper as to Sentencing Factors,” at: https://assets.documentcloud.org/documents/2798113/Hastert.pdf. 2. Information regarding the ACE study is at: http://www.cdc.gov/violenceprevention/acestudy/prevalence.html. 4. Mr. Miller’s letter and the FBI’s one page response is at: https://cdn.swimswam.com/wp-content/uploads/2014/10/USASwimming-GMLettertoFBIandFBIResponse-1.pdf. 5. The GAO report is at: http://www.gao.gov/products/GAO-15-418. 6. See: https://www.whitehouse.gov/the-press-office/2016/04/27/press-briefing-press-secretary-josh-earnest-4272016 and https://www.whitehouse.gov/the-press-office/2015/05/29/press-briefing-press-secretary-josh-earnest-52915. 8. Searching The New England Journal of Medicine’s website using the phrases, “child sexual abuse” and “childhood sexual abuse” yields no related research articles. 10. For information concerning Diane’s work, go to: https://www.edcinstitute.org/. 11. If you search NIH’s RePORT for “Dissociative Identity Disorder” the response is “did not match any documents.” See: http://www.cdc.gov/media/releases/2012/p0201_child_abuse.html and http://www.cdc.gov/violenceprevention/childmaltreatment/consequences.html. 12. See: http://www.pursuitoftruthfilm.com/. Lynn Rosenthal, who served up until earlier this year as the White House Adviser on Violence Against Women, did watch the documentary with a few office colleagues but refused to present the film to a wider White House audience. I wonder if this type of abuse occurs in other societies–western and non-western–to the same extent? You’ve made a good case; what would be a few good approaches to reduce this burden on our culture? Comprehensive and long over-due. As much as I think I try to stay on top of current affairs, I had no idea the problem was this deep or pervasive. I found I had mixed emotions about your criticism of elected officials for not publicly condemning Hastert–my initial reaction is they didn’t see the need to pile on. But, this is a crime against children, and as I think on it, it needs to be publicly condemned. Thanks for the article.